Keydet89 has listed a number of forensic and IR and RE tools. While on the topic of memory analysis tools, let's not forget the erstwhile and formidable Volatility. From the same site as the SWFRETools are some malware write-ups including NiteAim, and Downloader-IstBar. As a complete aside, here's a very interesting Gh0stNet writeup that Chris pointed me to recently (fans of Ron White refer to him as 'Tater Salad'...fans of Chris Pogue should refer to him as 'Beefcake' or 'Bread Puddin''...). WoanWare - several free forensics tools including a couple for browser forensics, and (like TZWorks) a 'USBStor parser'. Salvaging Digital Video Fragments: "
Digital video is becoming a more common form of digital evidence with the increasing prevalence of video in computers, mobile devices and cameras. Digital cameras can create high quality videos, most smart phones can create videos, and the iPad2 has two cameras that can create videos. The videos created by such digital devices can be stored on removable storage media and on the devices themselves. Frequent creation and deletion of videos on these kinds of devices can result in fragments of deleted video clips that most file carving tools cannot salvage. In addition, when dealing with Flash memory dumps acquired from mobile devices, data at the physical level is often fragmented. Specialized methods and tools are needed to salvage deleted video fragments as demonstrated in this article using the contents of Flash memory acquired from a Motorola V3 (RAZR) mobile device. Most file carving tools require a known file header in order to salvage deleted data. For instance, to recover a deleted 3gp file, most carving tools look for the file headers such as the following. 2 file headers were found. 2 files were retrieved. However, the salvaged files were invalid because the original files were fragmented. Furthermore, the names and directory paths of these files were not obtained using this method, demonstrating a further limitation of file carving. When video files are fragmented, it is necessary to consider the video file format in more detail. Fortunately, many digital video formats have a structure that can be used to find and salvage individual frames. A frame is a discrete section of the video that can have a timecode or sequence number and other characteristics that can be useful for salvaging digital video clips. The defraser tool can be used to identify frames for several video formats in a forensic duplicate of any piece of storage media, including a removable storage card, computer hard drive and Flash dump from a mobile device. The following screenshot shows defraser used to detect video related data in the Motorola V3 memory dump. Although the defraser tool does not automatically piece together the frames into a video that can be played, it does make the frames available for manual reconstruction. With some effort, defraser may be used to combine fragmented frames into a valid video file that can be played. As with file carving methods that rely on header signatures, the carving methods employed by defraser do not provide the filenames and directory path of salvaged video data in the context of the original file system. Ultimately, the most effective approach to extracting digital video files from acquired digital evidence such as a Flash memory dump from mobile device is to reconstruct the logical arrangement of data. On mobile devices, this logical structure involves the flash abstraction layer and file system. Using mobile device forensic tools such as Cellebrite Physical and XRY, it is possible to reconstruct and review logical file structure of a Flash memory dump as shown below with a 3gp video stored in an MMS related file in the Motorola V3 memory dump. Note that different tools may interpret the logical structure differently and show more files and folders, clearly demonstrating the importance of validating the results of forensic examination tools. Extracting the MMS file using such a mobile device forensic tool and extracting the video content as discussed in the “Delving into Mobile Device File Systems” blog post results in a 3gp file that can be played using VLC media player. After salvaging digital video files it is important to review the resulting data closely for potential anomalies. For instance, using MediaInfo to extract metadata from video files shows details related to its creation and format. The following screenshot shows metadata from a 3gp video extracted from the Motorola V3 memory dump, revealing that the embedded date-time stamp was set to an incorrect date. In addition, reviewing individual frames within a salvaged video file can reveal anomalies such as portions of two unrelated videos being combined into one salvage file. The following screenshot shows frames extracted from a 3gp file using DCCI Video Validator revealing footage from two unrelated video files. When a video file is fragmented or the header of a video file is overwritten, carving methods that rely on header signatures and contiguous files will not salvage video files successfully and may even incorrectly combine unrelated video fragments into a single file or fail to detect the presence of video content altogether. However, using specialized tools such as defraser, a digital investigator may be able to salvage fragments of video files and piece them together into a valid video file. This process of reconstructing video fragments is time consuming and error prone, particularly when dealing with numerous video files on a single piece of storage media or mobile device. Therefore, whenever feasible, it is preferable to reconstruct the logical arrangement of data to extract the complete content of video files. Whichever method is most effective for salvaging digital video, it is important to examine the results closely to ensure the accuracy and completeness of the resulting videos. Such a review includes inspecting embedded metadata for anomalies and reviewing keyframes for possible fragments of unrelated video footage. If you are serious about scrambling your internet traffic, SniffJoke is for you. It is a linux application that transparently modifies your TCP sessions, delaying, scrambling, injecting fake traffic, effectively making it impossible/very difficult for any one running a sniffer on your network, to figure out what is actually happening. applyies two concepts: the scramble and the hack. A sniffer to drop a packet who will be accepted by the server. The scramble technology brings in de-synchronization between the sniffer flow and the real flow. anew one, and if someone wants to make research on sniffers attack (or fuzzing the flow searching for bugs) need to make the hand inside its. The configuration permits to define blacklist/whitelist ip address to scramble, a degree of aggressivity for each port, which plugin will be used. for later off-line analysis by the investigator. and requires a PowerPC G4 or newer, or any Intel processor. More about the tool here. BlackBag Technologies has free forensic tools for Mac OSX and IOS. They come with "as is" warranty. They can be found here. (golden@cs.uno.edu / @nolaforensix ) or Lodovico Marziale ( vico@digdeeply.com / http://www.linkedin.com/in/lodovicomarziale ). the integration of it into Scalpel. It can be found here. These are the lastest entries added by SpiderLabs to the Web Application Security Consortium (WASC) Web Hacking Incident Database (WHID) Project. Incident Description: LANCASTER, S.C. -- The Lancaster County School District says hackers may have stolen the personal information of 25,000 students in the district's database. Schools officials are now trying to contact everyone who might have been affected. Information stored in the database goes back 10 years. Incident Description: Prosecutors have accused a Minnesota man of hacking into other people's Facebook and other computer accounts and stealing photos of women to post on adult websites. Prosecutors charged Timothy Peter Noirjean, 26, of Woodbury, with 13 counts of identity theft, alleging that from February 2010 through March 2010 he contacted women online and duped them into providing him with personal information that allowed him to hack their Facebook and other accounts. After hacking a Facebook account, prosecutors say Noirjean would pose as the owner to make contact with that person's friends and try to gain access to more computer accounts. Incident Description: It's looking more likely that loose-knit 'hacktivist' collective Anonymous may have pulled off the 'biggest ever' attack on Sony's PlayStation network (PSN), as company engineers are investigating the possibility that the online gaming service has been hacked. Incident Description: Being one of the region’s leading news agencies, Al-Arabiya which is part of MBC Group, the largest broadcasting company in the Middle East has been hacked by an unknown group signed only with ‘Crack_Man’ stating it has been ‘powered morocco’. The hacked website comes in a long lasting tradition of security flaws in the website leading to the recurrent event of the portal being hacked during political instability hits the region usually as an expression of disagreeing with what many consider the news agency’s Western oriented liberal point of view. Incident Description: Rolf Hilchner, CEO of Ashampoo, has posted on the company’s website explaining exactly what has happened. Apparently hackers managed to break into one of Ashampoo’s servers that held customer data. There was a hole in their security and by using it Ashampoo customer names and e-mail addresses have been taken, but no payment and billing information was accessed. Incident Description: Change.org, an online petitioning platform, has come under an ongoing distributed denial of service (DDoS) attack originating from China after the site hosted a call urging Chinese authorities to release artist Ai Weiwei from custody. Incident Description: The Children's Place Retail Stores Inc. said Tuesday that its customer email address database was recently accessed by an unauthorized third party. The database is stored at an external email service provider, according to company officials. The external service provider confirmed that only email addresses were accessed and no other personal information was obtained. Incident Description: Politically-motivated hackers are thought to be behind a DDoS attack on alternative news site Newsnet Scotland, launched on Monday days before Scotland is due to vote in fiercely contested local elections. The attack, if that's what it is, left the site unavailable from Monday afternoon into the early hours of Tuesday morning. Incident Description: According to a story released on the Auto Trader blog page, the Auto Trader website was subject to an attack from midday on Apil 19th until the early hours of April 20th. Incident Description: The website of water concessionaire Manila Water was hacked early Sunday, with visitors to the site seeing a small window indicating the breach. Incident Description: In an email interview with the IDG News Service, Bigr R, said he was a former employee of NextEra's parent company, Florida Power & Light. He said he used a bug in the Cisco Security Device Manager software used by NextEra to break into the site. "They gave to it public IP, so it was easy to hack into it through the Web," he said. "They used default passwords, which I got from one of administrators. Then I obtained level 15 priv. (superuser), and understood the topology of SCADA networks. Then it was easily to detect SCADA and turn it off." Incident Description: Login credentials for database, email and other key systems that a poster claims belong to the European Space Agency were posted on a full disclosure mailing list over the weekend. 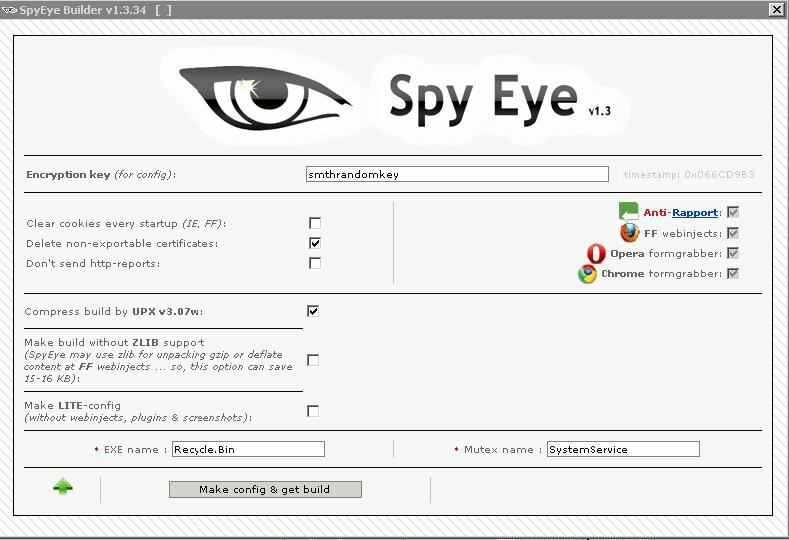 Aviv Raff, CTO and co-founder of security alert service Seculert, said that both SpyEye and ZeuS work by “hooking” the “dynamic link library” or DLL files used by IE and Firefox. However, Chrome and Opera appear to use different DLLs, Raff said. This strikes me as an incremental yet noteworthy development. Many people feel more secure using browsers like Chrome and Opera because they believe the browsers’ smaller market share makes them less of a target for cyber crooks. This latest SpyEye innovation is a good reminder that computer crooks are constantly looking for new ways to better monetize the resources they’ve already stolen. Security-by-obscurity is no substitute for good security practices and common sense: If you’ve installed a program, update it regularly; if you didn’t go looking for a program, add-on or download, don’t install it; if you no longer need a program, remove it. VUPEN Security claims to have pawned Google Chrome and has released a video prporting that claim. This effects Chrome version 11.0.696.65 and Win7 SP1 64-bit. This code that VUPEN came up with, bypasses ASLR, DEP and Sandbox. It is also silent, in that the browser does not crash after executing the payload. VUPEN claims it works on all Windows systems (x86 and 64). Chrome has survived the PWN2OWN contest for the past 3 yrs in a row. Security VUPEN style, means VUPEN does not disclose this vuln to Google. It however will provide it to its clients and customers, enabling them to protect themselves. This in effect means, that Google may not have any way of verifying these claims, anytime soon. This exploit is similar in nature to other browser exploits, Dude is tricked into visiting a webpage hosting exploit; Exploit gets executed, and then executes other payloads, ulimately downloading a malicious app from a remote location and dude is 0wned. Only difference here is that the malicious code somehow manages to run at medium integrity level.Duh!!! what are integrity levels. Look here for more details on this subject. Rob @ myownangle has posted this FTP keylogger that is not detected by any anti-virus at this time. Did someone say Anti-Virus is effective 40% of the time. Its 0% effective against any new threats. Signture based detection is DEAD. At the time of writing this malware, 2a61033a34be3dbbf0a3dfefdae4423c, has not been detected by any of the antivirus engines used by VirusTotal, 0 antimalware software out of 42 (0.0%) did not detected the threat. Anyway, this is a malware (keylogger) that uses an FTP server to send out information regarding the infected machine. It creates a directory in the FTP server (the directory is named as you PC name) and then stores information about the key pressed by the users. The malware creates differents configuration files (.sys extension - but their are textual files and not drivers) in C:\WINDOWS\System32\drivers. These files has been used as configuration files by the malware to send out information. It uses an FTP server to send out a file named: WinKey-[YOURCOMPUTER_NAME].html (in the directory system32).